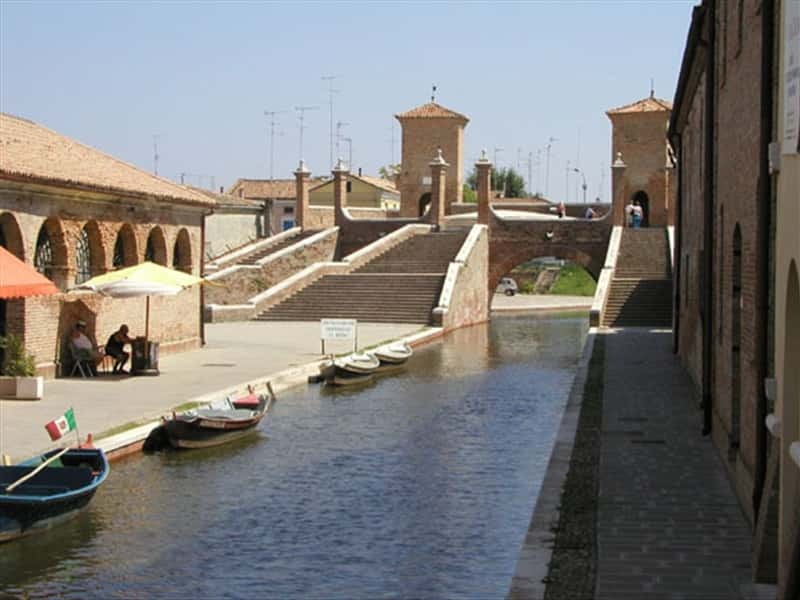 Also known by the nickname of "Little Venice", Comacchio, in the province of Ferrara, is one of the most important and interesting centers of the Po delta area. It emerges between the blue of its lagoons, crossed by bridges of red brick, that connect one to each other the islands, the town is a mixture of ancient churches, small fishermen's houses and noble houses that all reflect in the waters of the canals, today a famous destination for boat and yacht trips. There are various theories about the origins of its name: some historians believe that it derives from the Greek root "kuma" (wave), also attested by the early medieval word "cumaculum" (little wave), while according to a second interpretation, it derives from "commeatulus "(gathering of ships or humps, since, according to the local traditions, the town was built on 13 islands). The first settlements date back to the VI century B.C., when the Etruscans founded the ancient city of Spina. The discovery of Roman villas in the valleys, reclaimed from the water, evidence that in the area there was a Roman colony. Recently, excavations have brought o the light, the remains of a Roman ship (Fortune Maris) of the Augustan age with its whole cargo. After the fall of the Roman Empire the town became part of the Exarchate of Ravenna, and later part of the Lombard Kingdom. The "Chapter of Liutprand" evidences the existence of a community in Comacchio since the VIII century, with its own autonomy. After the expulsion of the Lombards by Charlemagne, the area was subject to the Papal States, a period in which its sea mouth location developed with strong commercial ambitions: most of the stone bridges and major monuments, in fact, date from this period. In 1860 it was annexed by the Kingdom of Sardinia. - the Roman Ship Museum, housed in a complex of Palazzo Bellini, exposes the hull of the ancient ship of Augustus and the remains of its cargo (amphorae, lead ingots, ceramics, tiles and votive temples). This town web page has been visited 19,446 times.